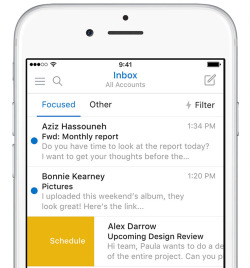 Two years ago, Microsoft launched Outlook for iPhone and iPad to critical acclaim. Celebrating the milestone, the Windows maker announced it’s bringing third-party integrations to your inbox with add-ins in Outlook for iOS. 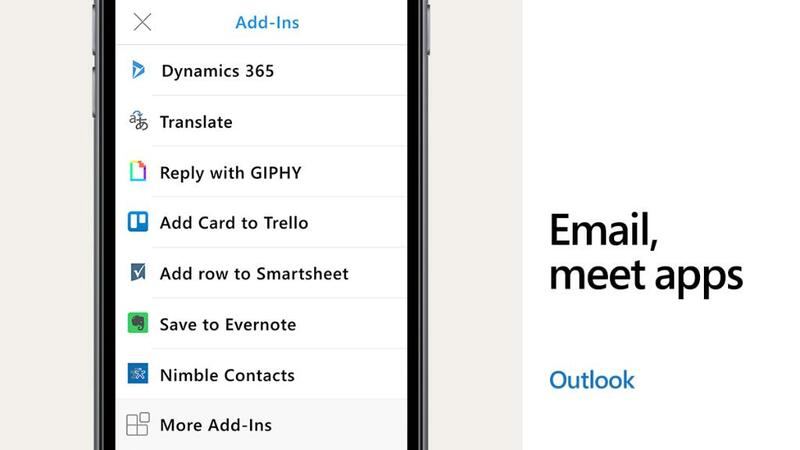 Not unlike Airmail or Readdle’s Sparrow, Outlook brings some of your favorite apps straight to your inbox so you can turn any email into a Trello card, save conversations in Evernote, translate messages in seconds and more. After enabling apps via a new Add-ins section within Outlook’s settings interface, you can start using them right away without installing the actual apps to your device. Add-ins were first introduced in Outlook for Windows/Mac and on the web. When you go back to your inbox and open an email to read, you will see a new add-in icon in the email header. Tap it to launch the add-ins you just enabled. 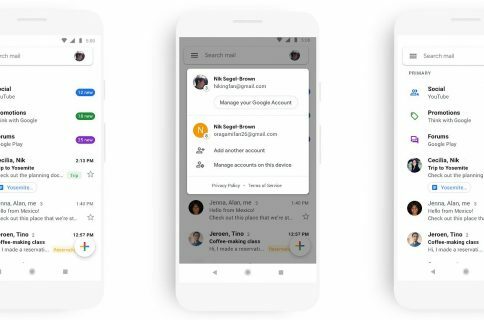 Mini apps that extend mobile Outlook’s functionality will be coming to the Android edition of Outlook soon, said Microsoft. 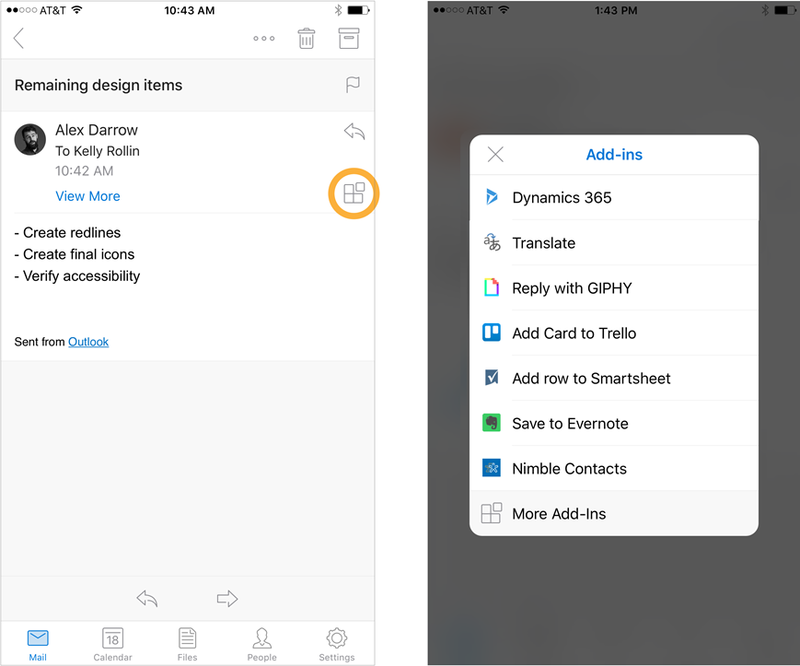 Third-party developers can create add-ins for Outlook for iOS using resources available from Office Dev Center. Dynamics 365—Real time insights about your business contacts in your inbox. Translator—Quickly translate your emails from 60 languages. Nimble—Rich business intelligence about your contacts and their companies. Trello—Create cards with descriptions and due dates directly from emails. Evernote—Clip emails from Outlook to a project notebook in Evernote. Smartsheet—Get your work assigned, updated and completed more quickly. GIPHY—Add GIFs to your emails like a boss. 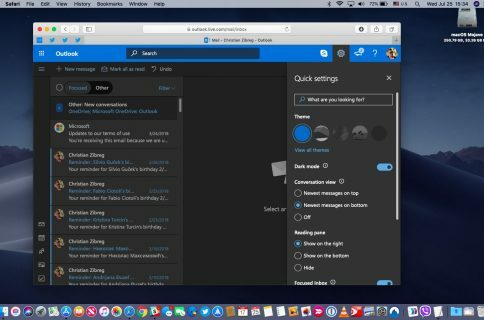 Here’s Nimble’s Outlook add-in in action. 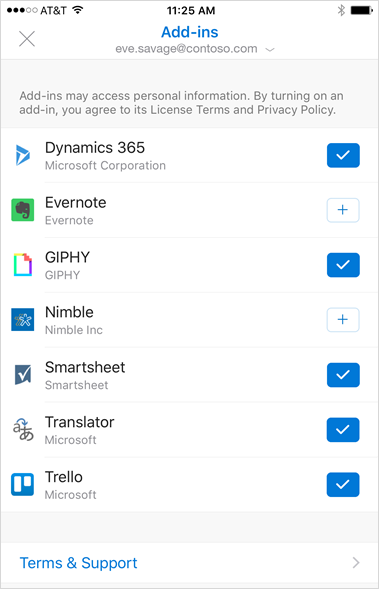 Third-party integrations in Outlook for iOS are currently available for Office 365 and are being rolled out gradually to Outlook on the web. Be sure to check out Microsoft’s blog post for more information on each of the aforesaid add-ins, including GIF animations showing them in action. Add-ins for desktop Outlook can be downloaded from Office Store. Grab Outlook for iOS for free from App Store.